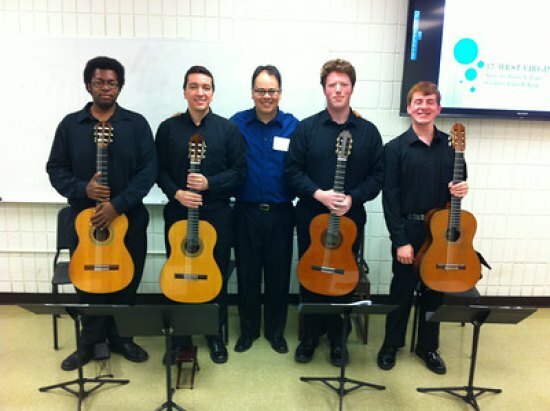 COSTA RICA NEWS – Four students from West Virginia’s Marshall University’s guitar ensemble will travel to Costa Rica in August to perform with students of the University of Costa Rica’s counterpart. Associate Professor of Music and Brazilian native Dr. Julio Alves will accompany guitar students Kareem Mccullough, Rodrigo Almeida, Jonathan Thorne and Erik Anderson from Aug. 7 to 17 in San Jose, Costa Rica. Alves formulated and presented the trip to Marshall University’s School of Music and Theatre and the University of Costa Rica’s School of Musical Arts in hopes of creating an exchange program to broaden students’ musical experiences. Marshall’s guitar ensemble will enjoy recitals and workshops about the local music, as well as give presentations on Appalachian music during their first-ever trip to Costa Rica. Marshall students also will perform concerts by themselves and with their Central-American counterparts. Performances from the trip will be available to watch on YouTube, Alves said. “The goal is that next year the guitar ensemble from the University of Costa Rica will have the opportunity to come to Huntington,” Alves said. The trip will be supported and funded by the College of Arts and Media.